Beyond the common grass types selected for home lawns are many native grasses indigenous to the state of Ohio. Ohio is a Midwestern state that experiences a humid continental climate—hot, humid summers and cold winters. Its various native grass species have adapted well to the soil conditions and sunlight exposure throughout the state. Perhaps the beauty of these native grasses are often overlooked, growing in the state’s nature preserve areas, along riverbanks, in parks and along highways. This perennial grass grows in Ohio, most of the eastern half of North America, Texas, Oklahoma and California. Also known as popotillo, yellow bluestem, broomsedge and whiskey grass, broomsedge bluestem (Andropogon virginicus) is planted for livestock and is used by wildlife for food and shelter. Broomsedge bluestem grows to 4 feet high in moist soil and full sun. It is often selected for ornamental landscaping, and its rooting system and growth pattern prevents soil erosion. Growing throughout Ohio and the mid and eastern region of North America, sweet woodreed (Cinna arundinacea) is a perennial graminoid that actively grows in the spring. At mature height, this grass reaches 5 feet. It needs full sun and slightly moist to dry soil. The widespread distribution of orchardgrass extends beyond Ohio, reaching as far north as Alaska and Greenland. Orchardgrass or cocksfoot (Dactylis glomerata) is a perennial graminoid that thrives in cool season regions. Its deep root system allows it to thrive and grow throughout the summer, although it prefers to grow in the cooler seasons. Its deep root system also makes it useful in erosion-control applications, and it is a food source for both wildlife and livestock. Orchardgrass grows to 3 feet in height. Another perennial graminoid of the Poaceae family native to Ohio, hairwan muhly (Muhlenbergia capillaries) also grows in the southeastern part of North America, from as far north as New York and also in Puerto Rico. As with many other grasses, it actively grows from spring through summer. Hairawn muhly requires moist soil and cannot tolerate drought conditions or full shade. Considered a low-growing grass, it grows to 3 feet in height and produces purple flowers in the fall and then seeds from the fall through the winter. Distributed throughout the United States excluding the west coast, and into Canada’s middle and eastern regions, switchgrass (Panicum virgatum) is a perennial grass that grows in moderately dry to very moist soils. It grows to 5 feet tall, actively growing in the summer, and its small yellow flowers bloom in midsummer. 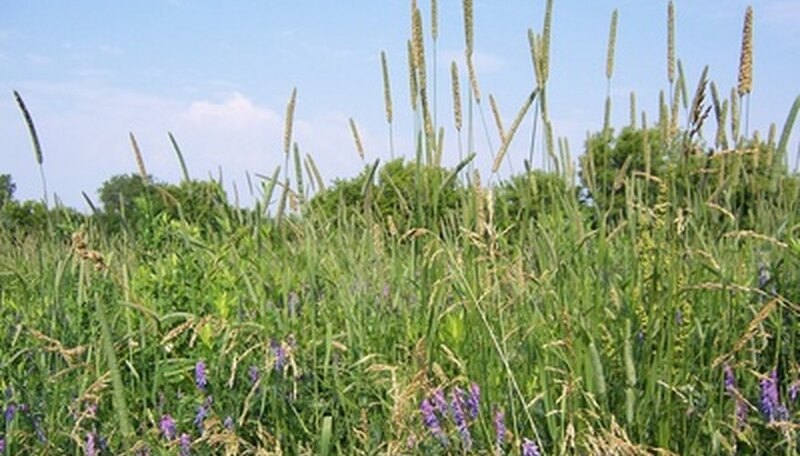 Swtichgrass is a natural resource that provides food and shelter for wildlife, food for livestock and its deep rooting system makes it a valuable erosion-control native grass. According to the United States Department of Agriculture, it may be an important source of renewable biofuel.